If I were to ask you, what is Punjab famous for, what would you say? Rows of mustard fields, lively people, rich food, tractors and most of all, bhangra, right? However, before all these things, Punjab is most famous for the , popularly known as Harmandir Sahib Gurudwara. Immediately recognizable by its golden colored dome, it is a symbol of human brotherhood and equality. The Golden Temple is revered by Sikhs all over the world both as a pilgrimage destination and as a holy site around which much of their religious belief is centered. If you want to know more about the Golden Temple, read the complete guide for Harmandir Sahib Gurudwara in Amritsar city in the state of Punjab. We are all fascinated with the Golden Temple, its architecture, langar (community kitchen), the sarovar (lake) etc. However, do you know how it all started? It was Guru Arjan Sahib, the fifth Guru, who was inspired with the idea of creating a central place of worship for Sikhs. It’s also interesting to know that it was the Guru himself who designed the architecture of the Golden Temple. The excavation of the Amrit Sarovar (Holy Tank) was carried out by Guru Ramdas Sahib under the supervision of Baba Budha Ji. Here is another fascinating piece of history for you: the land for the Golden Temple was acquired by the earlier Guru Sahibs from the Zamindars of native villages, sometimes on payment and at other times, free of cost. The work on the temple commenced in 1570 and ended in 1577 AD. The Golden Temple, or Sri Harmandir Sahib, as you know it, is a small part of the Golden Temple Complex. There are other structures within the complex which are important, both historically and spiritually. Let us take a look at some of the places to visit in the Golden Temple Complex. Central Sikh Museum was established in the year 1958 and contains paintings of Sikh gurus, Sikh warriors and other eminent Sikh leaders who have played a significant part in the advancement of Sikhism. Upon visiting the museum, you would come across a rich collection of old arms, coins and ancient manuscripts. There is also a library which chronicles the history of Sikhism and everything related to it. The museum is open on all days and there is a guide available on request. The entry is free. Some of the things that would attract your attention are guns dating back to the Sikh Kingdom, rare musical instruments, wooden combs of Guru Gobind Singh along with his turban, and other items. “Bunga” denotes a place to live in. During the rule of the Sikh Kingdom, several Sikh generals and royal families constructed nearly 99 Bungas in the city of Amritsar. Out of these, the Ramgarhia Bunga was constructed by the Ramgarhia Missal (Sect) to provide accommodation to devotees coming to the Golden Temple. At one point of time, there existed 22 watch towers around the Sri Harmandir Sahib, out of which only two have survived. You should visit the Bunga because it depicts the rare works of Sikh architecture. The Dukh Bhanjani Beri (Jujube Tree) is one of the three historical trees in the Golden Temple Complex. Dukh Bhanjani Beri, located on the bank of the holy sarovar (lake), has stood in this very spot since the 16th century. Legend has it that Bibi Rajni, one of the five daughters of Seth Duni Chand, a ruler of Patti area, had incurred the wrath of her father by her unflinching dedication towards God, quite unlike her sisters who were devoted to their father. Seth Chand, enraged by this act of devotion to someone other than her father, married her off to a leper, who she happily accepted as her husband. It’s believed that her husband, after taking a bath in the pond, was completely cured of his illness. This is how the tree came to be respected and held in the highest esteem by all those visiting the Golden Temple Complex. Interesting story, isn’t it? What is even more interesting is the fact that the devotees do not pick fruits from its branches. Rather, they sit under them, waiting for the fruit to fall on them. Located just next to the Dukh Bhanjani Beri is the outer parikarma (circle) of Sri Harmandir Sahib, known as Ath Sath Tirath. It’s believed that taking a dip in this pool is equal to the blessings received by visiting 68 holy rivers. If you have ever visited a gurudwara, you would be well-acquainted with the tradition of langar. Not only is the food (blessed by God) healthy and nutritious, but everybody shares the same meal, putting aside all differences. It is said that even the Mughal Emperor, Akbar, enjoyed the langar along with others before visiting the Guru. The idea of serving langar (community kitchen) was started by Guru Nanak, with the noble idea that everybody, irrespective of caste, creed and religion, would share a community meal. In a way, the Sikh ideal of quality and brotherhood is reflected in the tradition of the langar. If statistics are to be believed, then the community kitchen at Amritsar receives around 75,000 devotees on a regular basis. On special occasions, this number is nearly doubled. The preparation of meals is said to take around 100 quintal of wheat flour, 25 quintal cereals, 10 quintal rice, 5000 liters milk, 10 quintal sugar and 5 quintal pure ghee. Almost 100 LPG gas cylinders are used for preparation of the meals. These are the additional places relating to history and spirituality in Amritsar that merit a visit, along with the Golden Temple. Just like in any other religious institution or place of worship, visiting the Sri Harmandir Sahib, or the Golden Temple, requires you to respect certain norms and observe some etiquettes. One of these is wearing proper clothes while visiting the Golden Temple. If you are visiting the Golden Temple, you should always wear light colored and loose fitting clothes as it can get very hot inside the temple. Shoulders should always be covered while shorts should not be worn. Upon entering the temple, both men and women should cover their heads with a scarf. In addition, visitors should also remove their shoes and wash their feet by walking through pools before entering the temple. Don’t worry about your shoes being stolen as there is a cloakroom inside the Golden Temple where you can store your shoes safely. Will I need to stand in a queue before entering the Golden Temple? If you are worried about waiting in a queue to enter the Golden Temple, don’t worry. There are no queues as such inside the Golden Temple, except for the inner temple which contains the holy book, Guru Granth Sahib. Several fans are placed on the causeway to keep you cool. However, you should know that the street leading to the temple is always bustling with visitors and devotees. It can also get quite chaotic around the shoe cloakroom. Can non-Sikhs visit the temple? The Golden Temple is visited by pilgrims all over the world, especially India and Pakistan, on a regular basis. People of all faiths are welcome inside the temple. Another unique quality of the Golden Temple is that it is open from all four directions, enabling people to enter from any side. This also symbolizes the openness of Sikhs towards people of all religion, castes and faiths. 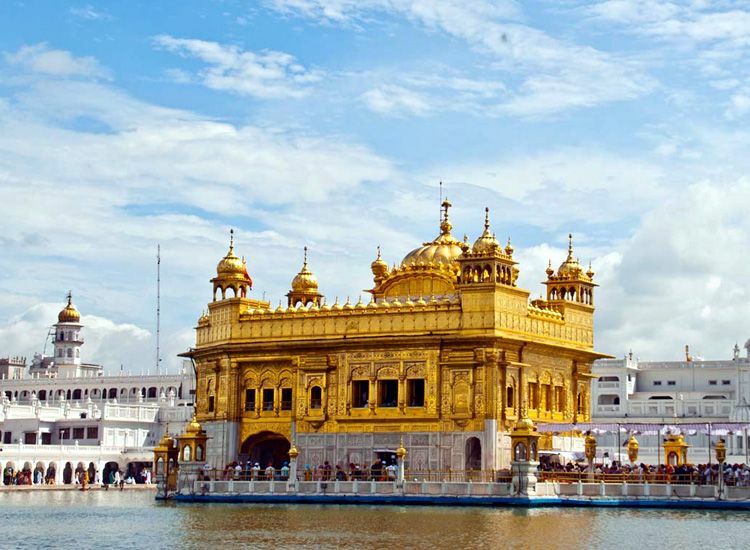 What are the other attractions in Amritsar? Since you will be visiting the Golden Temple, which is in Amritsar, there are other attractions too which you might check out. Two of the major attractions are the Jallianwala Bagh and the flag retreat ceremony at the Wagah Border. Jallianwala Bagh is associated with the infamous massacre which was carried out under the orders of General Dyer in 1919. It’s quite a moving sight to come across. Lowering of the flags ceremony at Wagah border is carried out by both Indian and Pakistani soldiers and marked by nationalistic fervor.